After 14+ years, we finally decided to feature Matt Johnson, our resident SJF Engineer, in the SJF Spotlight. 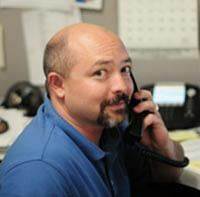 Matt is our Lead Engineer at SJF. He is involved in various stages of the sales cycle and is often called in to assist customers during and after product implementation. He also works with all departments and can definitely be called the “Go to Guy” for SJF. What do you like most about working at SJF? Every day is different. There are always new challenges. What do you enjoy doing when you’re not at work? Spending time with family camping, fishing and skating or playing hockey. What’s your favorite day? Friday. I look forward to the weekend. Biggest Pet Peeve? When people don’t listen well enough to retain information. People who complain about something but are not part of the solution. Name something about you, that people would be surprised to know: I had hair down the middle of my back in Jr. High School. What question would you like to answer that you didn’t get asked: Do you like being in the Spotlight? No. I don’t.